Born and raised in Harrisburg, Pennsylvania, Gaines’ musical interest was sparked at a young age, owing largely in part to his parents’ collection of soul records. But, it was his discovery of Ziggy Stardust-era David Bowie that truly sealed his fate, leading to his participation in local bands. After high school, Gaines was offered the singer slot for a New York rock & roll band, but turned it down to move to Philadelphia, where he signed with Chrysalis Records. 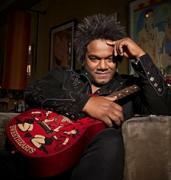 The first single off the critically acclaimed Jeffrey Gaines record was “Hero In Me.” Gaines performed it live on Good Morning America and received radio and MTV airplay. But, it was his cover of Peter Gabriel’s “In Your Eyes” which took #22 on Billboard’s Hot 100 Chart.